In roto offset print, especially during production with light-weight papers, there is the problem of breakage of paper due to the formation of condensate on the first and sometimes the second cylinder of the unit. The condensate is formed by the difference in temperature between the paper just out of the oven, and the surface of the cylinder that must cool it. 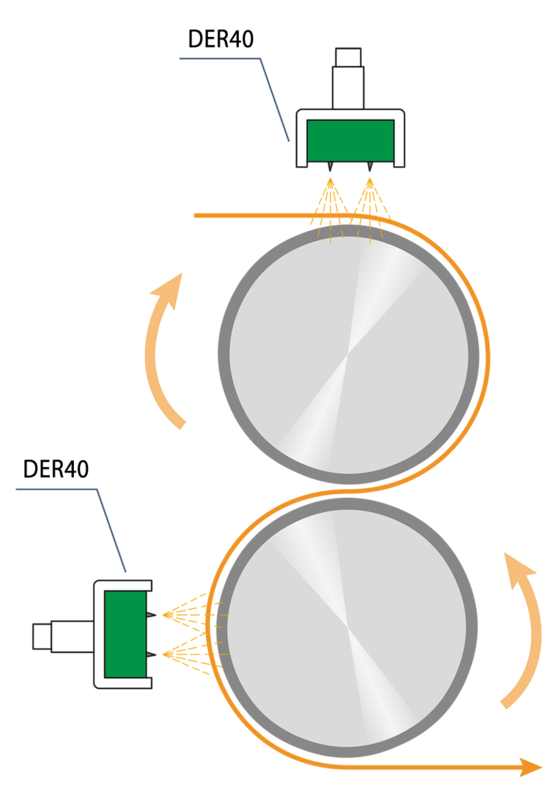 The air cushion that is formed between the side of the reel and the surface of the cylinder favours the creation of the condensate and the wet paper tends to break during folding. Another problem concerns the print quality. Precisely because of the above-mentioned condensate the cooling cylinders tend to become contaminated with ink, and then to transfer again on the paper stains that compromise the final printed material. The ACE solution to avoid these problems of the calendering unit of the offset rotators consists of two DE-R40 static charging bars, that when loading paper make it able to homogeneously and completely adhere to the surface of the calendering cylinder, completely eliminating the air cushion and the consequent creation of moisture between the two surfaces and thus favouring an absolutely better heat exchange. High speed, optimal heat exchange, elimination of the risk of breakage of the reel and deterioration in the print quality on calenders at the output of the oven in offset rotator. Another successfully application by ACE.